ThreadPoolExecutor consists of a pool of threads where the the size of pool is automatically adjusted based on the boundary defined using core pool size and maximum pool size. In this article we will look into the attributes that influence the way ThreadPoolExecutor maintains the thread pool. If we understand these parameters we will know how to tweak the thread pool’s behaviour to suit our own specific purpose. First lets see what happens when a task is executed. 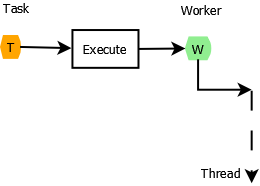 When a new task is submitted, a worker thread is created to handle it. Should the ThreadPoolExecutor create a new worker or use an existing idle worker thread depends on the core pool size. If the no. of workers in pool are fewer than corePoolSize threads are running, a new worker thread would be created to handle the request. It doesn’t matter if the pool has idle worker threads, a new worker thread is created till the pool grows to the size of core pool set. If no. of workers exceed the core pool size then no further thread will be assigned instead the task will be queued till one of the core worker becomes free to handle the cached task. If the task cannot be queued, a new thread is created to handle the task. The maximum no. of threads that can be created is bounded by the maximum pool size configured. If no. of threads would exceed maximumPoolSize, in which case, the task will be rejected. When all the core threads are busy, any new task submitted is added to the cache. The task will remain in cache till one of the worker thread becomes free to consume the cached task. What happens if there are no new tasks cached but the worker thread is now free? keepAliveTime will decide the time till which the worker thread will wait for the new cached task. If the pool currently has more than corePoolSize threads, excess threads will be terminated if they have been idle for more than the keepAliveTime. This provides a means of reducing resource consumption when the pool is not being actively used. If the pool becomes more active later, new threads will be constructed. By default, the keep-alive policy applies only when there are more than corePoolSize threads. In the below example, we create many tasks and submit it to the ThreadPoolExecutor. Number of core pool size used is set to three and the maximum pool size is set to four. We also have used a queue of capacity two. As you can see from the output below, a thread is created as soon as a task is submitted. 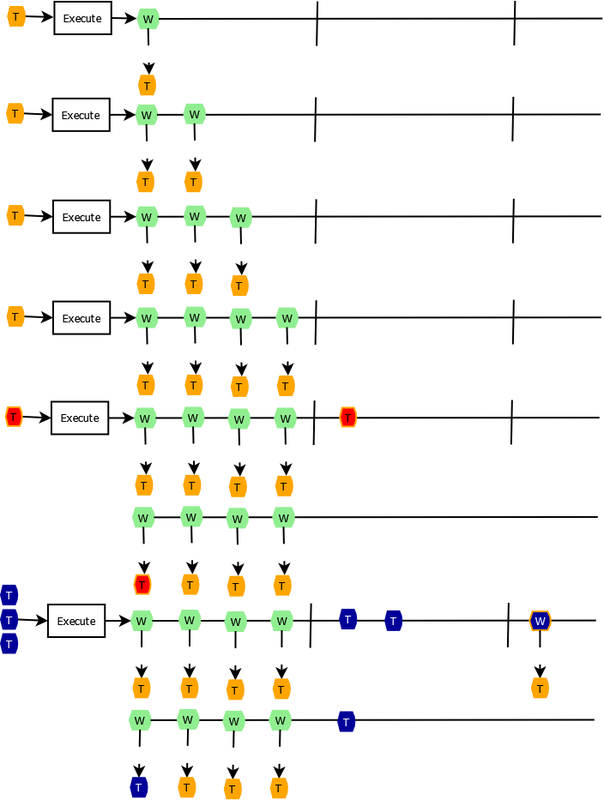 Thread ThreadPoolExec-1 is reused to handle MyTask(4) after executing MyTask(1). Later at some point fourth thread is created to handle task MyTask(9) as all the other three threads are still busy with their task. This was an example about internals of ThreadPoolExecutor.